Do you Dairy? Got Breastmilk? 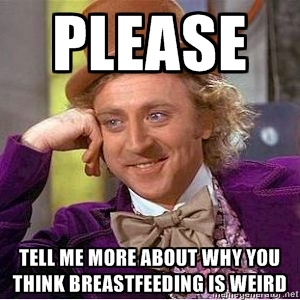 Monday night at our Birthing Class, our teacher, Rebecca brought up breastfeeding. Seeing as though we are birthing with a Midwife at a Birthing Center, everyone is very pro breastfeeding (we are taking a class on Saturday) But, I didn’t know much about it. A few of the soon-to-be Mom‘s and Rebecca began talking about Dairy and how it is most important to cut it out of your diet by week 36 if you intend on breastfeeding. They were talking about allergins and digestion. I tried to follow along and then went home to research it. I have done quite a bit of reading this week on the topic and really feel like there is not only so much to learn about becoming a parent, but also of the different nutrition and guidelines that different doctors and research put out there. I also know in fitness most diets/ or menus really cut out a lot of the dairy products anyway for numerous reasons. A very huge support and go to place for breastfeeding across the world is La Leche League. I found an article about Dairy consumption and breastfeeding. I am not a huge fan of dairy to begin with, I mean, I put milk in my cereal and once in awhile will dip a cookie in it. I eat yogurt once in awhile and have some cheese here and there…but over all Dairy isn’t my number 1 consumption anyway. I have begun at 33 weeks to cut dairy out of my diet. Cow’s milk contains a protein that baby’s can’t digest which results in upset stomach, diarrhea (often with blood in it), gagging, bloating, lack of appetite, itchy bumps on skin and skin rashes. This also leads to lactose intolerance and allergies along with colic. My body naturally produces all the milk, with all the human nutrients and varying flavors (based on what I eat) that my baby needs. So, why would I replace it with another animal’s milk or enzymes. My baby can get accustomed to all sorts of food and flavors, hopefully eliminating a picky eater later on. I found this paragraph on bring-joy.com, it left an impression. Of course when you begin researching so many things come up which then send you in circles (which is why I never read the pregnancy books when I became pregnant). There are so many do’s and don’t’s and expert advice and mommy advice and columns and chat boards…it really can drive you mad. I think as Mom’s we need to read what we can and figure out what we think is important and implement it, regardless of other people’s opinions. This is the first bit of knowledge in awhile that makes sense to me though. It seems as simple as, if your body makes it..why not use your own instead of something that is meant for a different type of animal? (which has a bit to do with my views on natural child birth as well) Obviously this little man has been growing inside of me for the past 32 weeks. He has been connected directly to my intake over all this time, so just because he comes “outside” why should that change? So my conclusions, I will breastfeed as long as possible (obviously not when he is 15 )…eventually pump so he can have it in a glass or bottle when he is a bit too big to be full on attached…and keep dairy out of my diet.